Few activities are mandatory in life like education, a good apartment to live in may be a long holiday per year and so on. This list will vary as per the given financial and family condition. Well, you can imagine anything! But you have to actually have the money to spend! And there comes the financial product called – Loan ! In a simple sense it is that monetary transaction in which one agrees to borrow a particular amount from a financial institution, for agreed lending rate. Loan creates debtor-creditor relationship between a person who borrows and the financial institutions (FIs) which lends money. Loan contract consists of detailed working of terms and conditions which includes the rate at which borrower will make the repayment of loan amount, tenure of loan, security against which loan is sanctioned. Let us now consider different types of Loan Products offered by Banks and Financial Institutions. This is most important and popular form of loan in India. It facilitates the buying of valuable property for all income groups of the society and it’s an important part of loan book portfolio of banks too. Rate of interest on housing loan is different for every bank. Since April 2016 MCLR is used by banks to decide the ROI. MCLR stands for Marginal Cost of Funds based Lending Rate. Rate of interest is calculated on reducing balance method, this can be Annual, Monthly or Daily Reducing balance method. If you are salaried individual, then you will have to furnish a Salary Slip or Salary Certificate of last three months or as demanded by bank. In case of a professional income or a business income category along with IT Returns a copy of Balance Sheet & Profit & Loss A/c for last three years is required. In case of certain professional case like Doctor, CA Certificate of Registration might be asked by bank. Bank will also ask you to declare your source of funding of own contribution towards buying a property. This amount is also called as margin requirement. Simply speaking, this type of loan is sanctioned for any personal need of an individual. It may be your emergency monetary requirement, family holiday, buying any gadget for personal use and many more. The Rate of Interest charged by most of the banks on Personal loan is usually higher than home loan. Repayment schedule is also of lower duration. This loan is processed by bank quickly. Everybody has a dream car to buy or may be a two wheeler for a regular use, it’s now easy to buy so because of Easy Vehicle Loans offered by Financial Institutions. Attractive rate is offered since there is tough competition among bankers in this category. Normal documentation is required and you will have to make nominal down payment of your selected vehicle. Generally repayment tenure is low as compared to Home Loan. This is most famous and widely offered loan product by Banks and NBFCs (Non Banking Finance Companies). Since Gold is most trusted precious metal, families do invest a part of their savings into Gold making it a collateral security for borrowing. Banks accept gold in form of coins of jewelry also. After proper valuation loan is sanctioned up to 60 per cent of its value (this may change). These days Gold Loan has lost its sheen due to flat trend in gold value. In last decade gold value seen much appreciation which is not the case since last five years. Indian economy has significant contribution from agriculture. More than 50 per cent population is engaged in agro-based activities. FIs provide agro loans for various agriculture purposes ranging from buying land, refurbishing land, irrigation facilities, agricultural equipments to buying seeds, pesticides etc. In some cases bank may offer loan at concessional rate. Some agriculture loans are subject to subsidies provided by NABARD or Government agencies. 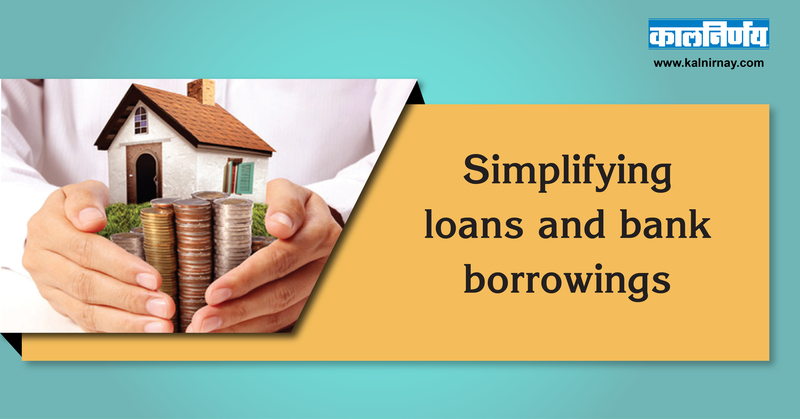 These loan products are specially designed for the business or current account holder. Against securities kept banks give overdraft and cash credit facility for short term duration. Like banks provide loan against FDs or NSC (postal investment option) they do provide loan against shares also. Mutual Fund Units or Shares are valued by banker and certain percentage of that value is considered for Loan. Rate of Interest and Proportion of funds to be given can be different as per banks rule. CIBIL Record : Are you financially prudent? When you apply for a Bank Loan your CIBIL score is calculated by bank or FI. This is to verify and confirm the creditworthiness of a borrower. In this system your credit history is checked by banker to evaluate the promptness in settling the liabilities, clearing dues if any. Each bank has different ways to calculate this score. What you have to remember is high score means high scope of getting loans more easily as well as at competitive rates. Be regular in meeting all dues on time! To sum up, one should be careful in taking additional liabilities, if you can manage the repayment in a specified time you can avail more loans in future. This financial product should be used wisely!